Tonight the weather radar map is enveloped in flames of orange and yellow; it has been an evening of very satisfying lightning displays, except possibly for this gentleman who was blown out of his boots when hit by a bolt. The people of the past probably feared lightning more than they enjoyed it—it was a hazard to those working outdoors and it could burn down a well-filled barn in minutes. There were a number of superstitions about lightning: it was bad luck to burn wood from a lightning-struck tree, oak trees were more likely to be struck than beech, a toothpick from a tree struck by lightning would cure toothache. And certain things would “draw” lightning: Milk in a pail, moist hay, bayonets, a warm horse, an umbrella or fishing rod. Put a plug of sassafras in one pocket; and a sprig of hazel in the other to protect yourself from the deadly fluid so we can examine some of the items said to “draw” lightning and a random assortment of its freaks. 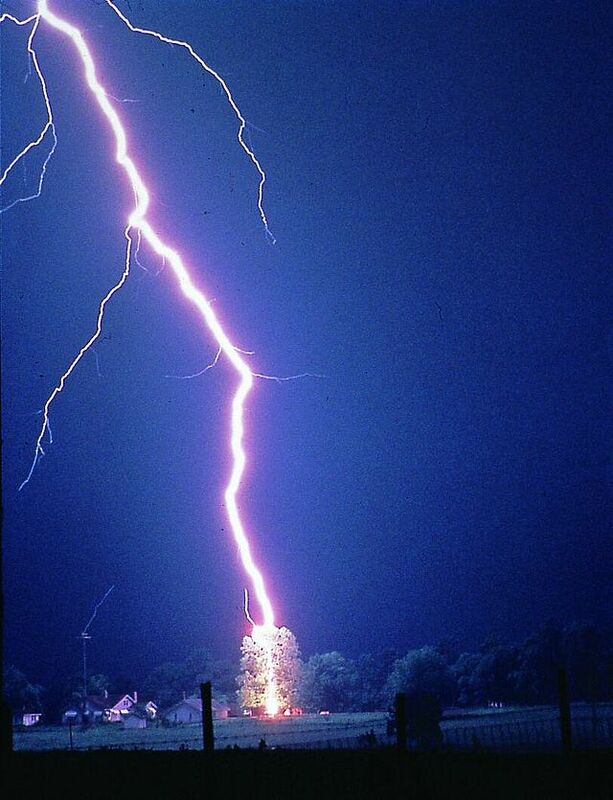 Clothing was one of the most common items believed to “draw” lightning. Depending on the time period, women’s costume contained a good bit of metal—corset “bones” were actually steel; hoop skirts and some bustles were also formed of steel. Lady’s accessories might also be metallic: hat frames, hair pins and combs, cut steel buttons and bead ornaments, buckles and jewelry. Three Young Ohio Women Killed by Lightning After Leaving Church. Bellaire, Ohio, June 15. While Minnie McGuire, daughter of the Rev. Thomas McGuire; Alpa Taylor, daughter of William Taylor, and Emma White, daughter of Simon White, each aged about 19 years, were returning home from the Methodist church at Jacobsburg, walking together in the road about 100 yards from the church, they were struck by lightning and killed. When Lightning Struck Little Girl and Revealed Her Secret. Petersburg, In., May 5. Lightning struck the hand-made and secretly-worn corset of nine-year-old Mary Taylor to-day and almost ended her life. The little girl, a daughter of a farmer living near this city, wanted to wear a corset. So she gathered some tin cans, slipped into the hayloft of the barn, and, with a hatchet, cut and shaped her “stays.” With a piece of muslin she then made what was at least an imitation of a corset. Coroner’s Physician Donlin made his report yesterday of the autopsy in the case of Mrs. Juliet Albert, who was killed by lightning at her home at High Island, near City Island, last Wednesday. He found that the lightning had been attracted by a pin which Mrs. Albert wore in the neck of her dress. The lightning struck the point of the pin, melted it, and drove it through her dress, embedding it in her flesh. The skin around the pin was scorched. There were no other marks on the body. But it was crinoline/hoop skirts that caused the most consternation during storms, as they were believed to be a positive magnet for lightning bolts. Prosthetics were also said to be a lightning magnet. Iron Braces on Artificial Limb Attract Electricity Which Badly Burns Railway Signal Man. Kansas City, Mo. During a severe thunderstorm G. Richards, fifty-eight years old, 3019 Dunham avenue, a signal man for the Kansas City Belt Railway company, was struck by lightning in his tower at Twenty-fourth and Penn streets. He is in the General hospital being treated for serious burns. Richards was at work at the time the lightning struck the towers. The bolt first struck the stove pipe that extends through the roof of the signal station and it followed the pipe to the interior where the lightning continued its downward course with Richards in its path. “If Richards had not worn an artificial leg, I don’t believe the lightning would have struck him,” Dr. G. C. Remley a police ambulance surgeon, said. “His left leg is cut off below the knee and his artificial leg has iron braces which are held in place by a belt that encircles his body. It is my opinion that this metal attracted the electricity to the man. The effect of the lightning is shown in burns over the lower portion of Richards’ abdomen and legs. The lightning followed the artificial left leg from a point a few inches below the knees. The limb was splintered and at the toe of the shoe a hole was torn in the leather, giving appearance of something having been thrust through from the inside. The pipe from the stove was wrecked, a window knocked out, and the contents of the room were scattered about. Lightning lent itself to tall-tales. And Be It Understood Every Bird Was Done to a Delicious Brown. Chillicothe, Mo., Nov. 3 A freak stroke of lighting at the home of Jacob Bruner, a farmer, residing south of town, yesterday killed a flock of wild ducks that was flying past. Every duck was killed. An extraordinary lightning freak is reported from Boulay, near Metz, during yesterday’s thunderstorm. A man named Doyen, who was hoeing potatoes, was killed by lightning, his clothes being torn to rags. His wife and the two men who were near had their clothing torn, but escaped uninjured, except for the fact that by some unaccountable freak the lightning painted their faces a bright red and their lips black. A common theme in lightning death stories is the freezing of the body in its last position—men were found dead on their feet, or raising a glass to their lips—or, in this case, driving a hearse. A scene of unprecedented horror was enacted during the electric storm a few days since, when a funeral cortege had drawn up to the entrance of the Sharp-street Cemetery at Mt. Winans. It was the misfortune of the part to arrive at the cemetery entrance just as the worst storm of the season broke. When the funeral procession arrived at the cemetery and had almost stopped at the side of the grave bearing the dead body of Mary Brown, a colored woman, a lightning bolt, which stunned all the members of the party, instantly killed William Alsup, who was driving the hearse, and started the horses drawing the hearse on a dead run. The deadly bolt at first stunned one of the hearse horses, bringing him to his knees. He was but shocked, however, and being, like his mate, a fiery steed, the regaining of his feet was but the signal for a runaway. Just as Roy Sullivan believed that he was a target for multiple lightning strikes, certain sites seemed hoodooed. There is also a folk belief–mentioned in the article which appears at the head of this post– about the man whose steel-toed boots were struck by lightning–that once a person/place has been struck, they are much more likely to be struck again. Lightning Uncoffins a Victim of Lightning. Fort Ogden, Fla., August 4—Lightning has been very fatal in this section the past month, over eight people having been killed by it. Many strange incidents are related, the most extraordinary being a story from across the Kissimmee River told here today. Henry Myers was killed by lightning there last week while in a field, and buried the next day. The second day a heavy thunderstorm arose. His grave was struck, the lightning tearing open the grave, throwing the coffin out and breaking it open. Lightning Kept the House Vacant. Not far from Hodgenville stands an old house which has a wonderful power for the attraction of lightning. It is in an unused field, surrounded by shrubbery and undergrowth. It is only the frame of a once costly dwelling, and has been standing there for 40 years. Strange as it may seem, it has been struck by lightning every time an electric storm has visited that section. Open By Lightning and a Premature Burial Was Avoided. A bolt of lightning saved a child from premature burial yesterday at Hanston, 20 miles from this city. The five-year-old daughter of Samuel McPreaz, a rancher, apparently died on Saturday morning. Funeral services were arranged, the body prepared for burial and no one noticed a sign of life remaining in the little body. Yesterday the funeral services were held and the procession started to the cemetery. A storm was gathering at the time. On the way to the cemetery a bolt of lightning struck the hearse, burst open the metallic coffin in which the body was incased, knocked down both horses and stunned the driver. When the frightened mourners reached the hearse the little girl was sitting up crying for her mother. For a few moments the persons who witnessed the occurrence were too frightened to move, but finally the little girl was taken up and driven back to the house as fast as possible. Her parents believe the bolt was sent as a miracle and the people of the vicinity speak in whispers of it. Physicians declare the little girl was in a cataleptic condition and the shock revived her, but many residents believe she was dead and came back to life. Telegrams from Hanston to-night say she is recovered and feels no ill effects from being incased in the coffin for 24 hours. The lightning destroyed one side of the hearse and melted a portion of the coffin. Persons living in the vicinity of Hanston, who were in the funeral procession, tell many strange stories in connection with the occurrence. Some of them say that just prior to the flash of lightning a peculiar soft, mellow light appeared in the sky, which was so pronounced in its difference from sunlight as to attract attention and occasion comment, and that while the peculiar atmospheric conditions were being discussed the clap of thunder and the flash of lightning riveted their attention upon the strange scene which followed. Thomas E. Leftwich was the editor of the Larned Eagle-Optic. In 1902 he and a partner bought the Winfield Tribune so his thrilling story didn’t seem to hurt his rise in the newspaper world of Kansas. If anything, it demonstrated that he had what it took to get circulation: the tale appeared in more than a dozen papers far outside of Kansas. But was the story really false? There are other accounts of coffins blasted open by lightning, and the resurrection of their occupants. Are they just rural legends? Any other stories of fire from heaven? Discharge the current harmlessly before sending to Chriswoodyard8 AT gmail.com. See also my post on “lightning daguerreotypes“–images said to be etched on glass by bolts from the blue.